With quiet, flowing characteristics, the text of this original anthem aptly depicts the imagery of the Advent season. Optional flute and cello parts complement the texture and expressiveness. The flexible choral parts have been conceived to be performed with either SATB or two-part mixed choirs. Flute and Cello parts are available as a free download from the publisher. The greatest gift is Jesus, whose death for our salvation is a glorious blessing. Ruth Elaine Schram&apos;s medley of three beloved, traditional hymns tenderly reminds us to count our blessings with an arrangement that is versatile for both large and small choirs. Choirs large and small will find this flexible anthem to be a tender, readily learned addition to their Advent or Christmas programs. The message touches on several prominent themes, making it an ideal option to return to again and again: "Bring us hope, bring us love, bring us peace from above." With or without piano accompaniment, this infectious rhythmic anthem is easy to prepare and fun to sing! For Advent or Christmas, with optional Hand Drum part included in score. This haunting, simple melody, co-written and recorded by Michael W. Smith, is a perfect fit for the arranging gifts of Ruth Elaine Schram. The gospel-focused text by Paul and Martha Puckett, so simple even a child can sing and understand, is as beautiful as the melody that presents it. This SATB setting is signature Schram, as she gives line and movement to the inner voices in a way that creates both tension and interest. The optional instrumental accompaniment (Keyboard, Violin 1 & 2, Viola, Cello, and String Bass) is lush and supportive, but in keeping with the simplicity of the vocal importance of the anthem. Your choir will thank you for the opportunity to sing this work! Orchestral Score available in print or CD-ROM format. A lushly recorded Accompaniment Track is also available. 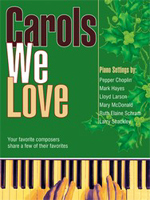 Similar to its predecessor, Hymns We Love, six well-known contemporary church music composers have each chosen two of their favorite carols to be included in this collection for piano. As an added bonus, each arranger tells why they chose these particular pieces and why they set them as they did. A wonderful addition to your keyboard library, or a perfect Christmas gift for your favorite pianist! Ruth Elaine Schram and her daughter, Celsie Staggers, have collaborated on this gentle anthem with a powerful message exploring the mystery of Almighty God becoming a tiny Child, fragile and helpless and at the mercy of those in whose care He was placed. "...a manger holds redemption's plan: the Son of God, the Son of Man! Behold, the Holy Child of whom the angels sing: a Child, a King! The Holy Child, my King." For SATB voices and keyboard, with optional String Orchestra. Inspired by and dedicated to Ruthie's granddaughter, Natalie Grace (whose name means "Christmas Grace"), this tender offering beautifully reflects God's gift of grace to us through His Son. Seeing the helplessness of her tiny, brand new grandbaby was the inspiration for this timeless piece. "To take God's Son from heaven, to turn the Lord of all into a helpless infant, a baby weak and small; to give to our Creator a fully human face: This is Christmas Grace..." Hints of "Amazing Grace" occur in the piano accompaniment and String orchestration for added emphasis to the theme of God's grace coming to us in the form of a tiny Child. String Orchestra score and parts available separately. This lovely original Christmas anthem by Ruthie Schram and Paul Baertschi boasts inspired text imagery and incorporates mesmerizing references to the favorite carol "Away in a Manger." This flexibly voiced anthem works beautifully either with SAB or SATB voices, and has a lovely flute part which is included in the octavo. Performance/Accompaniment CD available. Ruth Elaine Schram presents this energetic, syncopated original selection with dual texts, one each for Advent and Christmas. Call-and-response choral writing with dynamic contrast makes it both fun to sing and to hear! The flexible vocal texture is great for smaller adult or youth choirs. What a nice change of pace to have something upbeat for Advent! An optional Percussion part is available from the publisher as a free download. Ruth Elaine Schram pairs the chant-like "O Come, O Come, Emmanuel" with an expressive original melody to create this sensitive Advent anthem. Its flexible voicing (for SAB or SATB) makes this piece a versatile choice for seasonal worship, and one that will be easily learned in minimal rehearsal time. Part for optional C instrument is included in score, and an Accompaniment CD is available. The tender text of this sensitive original anthem reflects Christ's great love for us on Calvary. A delicate melody with moderately easy choral parts shares a brief a cappella section incorporating the beloved "Man of Sorrows, What a Name" ("Hallelujah! What a Savior," by Philip P. Bliss) before the quiet, fitting conclusion. Suitable for Lent or Holy Week, with Optional String Orchestra as well as Piano accompaniment. (String Orchestra includes Violin I, Violin II, Viola, Cello, Double Bass, and Reduction.) P/A CD also available. 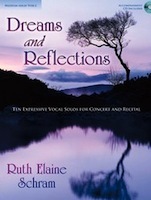 This outstanding vocal Solo Collection includes ten of Ruthie's beautiful, inspiring original works alongside her creative arrangements of folk songs and spirituals. These solos may be used individually, or the book is laid out in an artful programmatic order to support performance as a complete recital. The ranges are moderate and well within the capabilities of the developing voice (Medium-high: Middle C - 5th line F; Medium-low: A below Middle C - 4th line D). Accompaniment CD included. This fervent plea for the Messiah to come is truly a creative blend of familiar texts and tunes that work surprisingly well when partnered. Ample unison passages ensure quick preparation of this devotional anthem during the busy Advent/Christmas season. The optional cello part (included in score) adds a dimension of warmth to this inspired anthem. Based on scripture passages and perfect for special occasions throughout the year, this original selection serves as a tender tribute to those who inform and shape our lives. The flexible vocal texture suits any combination of voices, and the optional flute and/or cello accompaniment options add a unique touch to this heartfelt piece. From the "Ready to Worship" collection, the score is easy to read, learn, and sing. Suitable for Mother's Day, Father's Day, Funerals, Graduations, Teacher or Pastor Retirement or Relocations, and many other occasions. Flute and Cello parts are included in score. Built around a brass quintet nucleus with piano accompaniment, the "Brass and Ivory" series is designed to provide practical yet creative resources for church musicians. The arrangements in this series are crafted by some of today's leading arrangers, and they are worthy considerations for preludes, offertories, and general service music. They are accessible for most church, school, and community brass ensembles. Flexibly voiced for Trumpet 1 and 2, French Horn (or Trumpet III), Trombone 1, Trombone II (or Tuba), and piano. Ruth Elaine Schram's arrangement of "Fairest Lord Jesus" is a worthy addition to this series. Suitable for general use throughout the church year, the familiar "Crusader's Hymn" is given a fresh, expressive treatment your brass and keyboard players will quickly master. Ranges are comfortable and accessible for most volunteer musicians. This anthem of grateful devotion celebrates God's wonderful gifts to us. Quoting I Chronicles 29: 1, 14, the text reminds us that all that we have already belongs to the Lord. Opening with original music, it quite naturally leads to a statement of the beloved traditional hymn "Hendon" by Frances Havergal and Cesar Malan, "Take My LIfe and Let it Be." Elegant keyboard accompaniment is crowned by an optional obbligato for flute or other C-instrument. For General, Harvest, Thanksgiving, or Stewardship use. Based upon the traditional spiritual, "Follow the Drinking Gourd," this mesmerizing setting is full of calls and responses to "follow, follow" and is easily accessible and wonderfully crafted for church or school choirs. The light percussion adds a little something extra to this wonderfully crafted Christmas anthem, flexibly voiced for Two-part any combination. Ruthie Schram's considerable gifts as a lyricist and melodic writer abound in this poignant reflection upon Christ as He prayed alone in the Garden of Gethsemane. The lyrics recall the gospel story. The music flows in 3/4, with sensitive text declamation and colorful harmonies. An optional oboe (or C Instrument) obbligato adds a mournful touch. Shepherds brought humble gifts of love, wise men brought expensive gifts of adoration, while angels brought celestial lullabies to the Christ Child. The gift of the present-day seeker, as this poignant anthem by David S. Gaines and Ruth Elaine Schram states, is to offer "the gift of my life" in response to the gift of His life for us. A lovely pairing of two traditional spirituals, this artful arrangement opens with "Give Me Jesus" then flows so seamlessly into "Steal Away to Jesus" that the listener is unaware of the change to the second tune. Beautiful harmonic colors and a supportive accompaniment make this anthem a great addition to any library. Suitable for General Use or during Lent. The new Vocal Duet folio works with male or female voices. Ideal for blended worship settings, the Don Moen praise and worship favorite "God Will Make a Way" is beautifully partnered with the hymn classic "He Leadeth Me" by Joseph Gilmore and William Bradbury. Supportive accompaniment and carefully crafted vocal parts make this an accessible anthem for choirs large or small. In "God's Big Family," celebrated composer Ruth Elaine Schram has crafted a great resource for today's Christian children's choirs. Its six easy unison anthems are both fun and fun to sing and include optional second voice parts written in easy-to-teach formats such as echo, call and response, and partner song. With texts that serve the entire church year, each piece in this collection features a supportive and playable keyboard accompaniment. Songs are included for Advent, Christmas, Easter, Family Emphasis, and General use. There are also optional parts for small percussion and body percussion that reinforce rhythmic acuity, and optional body motions and sign language provide beautiful visual appeal while developing gross motor skills. The corresponding reproducible narrations make these anthems perfect for worship, Sunday School and Christian School programs, and special fellowship events. The collection includes reproducible song sheets and (if purchased in this format) a Performance/Accompaniment CD delightfully orchestrated by Tim Hayden. In this inventive arrangement, Ruth Elaine Schram has paired the spirituals "Wayfaring Stranger" and "Guide My Feet." Each haunting melody flows seamlessly throughout the expressive vocals and accompaniment, and flexible voicing options allow for SATB, SAB, or Two-part choirs to perform this creative selection at any time of the year. Celebrate Hanukkah with this delightfully singable selection by Ruth Elaine Schram and Linda Marcus. Much melodic repetition and accessible options for percussive additions will have your performance ready in no time. Ruth Elaine Schram and her friend since childhood, Paul Baertschi, have combined their talents to create this charming arrangement, which incorporates "Gesu Bambino." Creative choral lines are supported by a flowing keyboard accompaniment that can be augmented with the use of optional flute and cello. A wonderful choice for Christmas Eve services celebrating the awe of Jesus' birth. This powerful Christmas anthem unexpectedly and powerfully incorporates the hymn, "Holy, Holy, Holy." Its poignant message speaks of the holiness of the Christ Child and the impact of His birth on us today. Available for SATB or SAB voices, this anthem has strong dynamic contrast and a heartfelt, memorable melody. Beautiful String Orchestra Score (available separately; includes a reduction) or Accompaniment CD are also available. Perhaps the world's most beloved carols, "Silent Night" and "O Holy Night" are masterfully combined in this powerful arrangement by Ruth Elaine Schram. The two classics shimmer with rich harmonies, and the addition of the optional string orchestra create a sense of wonder and awe at God's gift of love to us at Christmas. Fitting for worship services and pageants as well as seasonal concerts, this heartwarming choral captures the beauty and essence of the birth of Christ. For mixed or ladies' voices. String orchestration includes reduction for Synth. Commissioned by the widow of David Davenport, this setting of his thoughtful text is gentle and captivating. The beautiful text images in this artful anthem are reinforced by subtle musical references to "Silent Night, Holy Night." Ruthie's melody is unforgettable. Perfect for Christmas Eve services, there is a dual text with Dave's original poem, "How Beautiful on Christmas Eve." Six well-known contemporary church music composers have each chosen two hymns to be included in this refreshingly unique collection for piano. Also included are their personal stories and thoughts about why the chosen hymns are their favorites. With the overwhelming success of the Lorenz collection "Hymns We Love to Sing," (45/6111L) they are delighted to present the second installment of musically sound, accessibly voiced anthems. Featuring arrangements by some of the top composers and arrangers in the industry, this collection contains music written from a place of spiritual sincerity and musical practicality for the church choir of today. A number of the selections include the option for additional instrumentation, and an accompaniment CD is also available. With a wide breadth of styles and accompaniment options, this easy-to-prepare collection is sure to become a staple in your choral music library. In 2006, Lorenz brought together a team of six top arrangers and asked them to write new versions of some of their favorite hymns. That book, "Hymns We Love" (70/1791L), was so popular that it generated four successful sequels. Now, for the sixth and final book in the series, Lorenz decided to turn the tables and let their audience pick the music. So here's the result: twelve selections from your favorite team of arrangers, all on the list of "top hymns" drawn from the online survey. Each piece is preceded by program notes from the arrangers: Ruth Elaine Schram, Pepper Choplin, Mark Hayes, Lloyd Larson, Mary McDonald, and Larry Shackley. Here is the Southern folk melody RESTORATION and its familiar lyrics in a subtly intense a cappella arrangement, featuring a variety of robust choral textures that dramatically fade into a quiet, comforting, and unexpected ending. Voiced SATB, with limited divisi in the Soprano and Alto only. This collection is a second volume in the popular and versatile format initially created by Ruth Elaine Schram. These creative and practical arrangements work equally well as solos or duets by any combination of C and B-flat instruments. They are ideal for preludes, offertories, special music, or recital programs. This collection features hymn tunes that are particularly suitable for Spring, Lent, and Holy Week, as well as general use. There has been a resurgence of instrumental music programs in our churches in recent years. One of Ruthie's goals is to provide resources for Volunteer Musicians to use their unique gifts for the Lord. These arrangements are written with them in mind; the music will not look intimidating but will sound fresh and captivating to the listener. An Accompaniment CD is included in the book to be used for Rehearsal and/or Performance, or as a demo to assist live musicians in interpretation of the arrangements. A haunting keyboard introduction recurs as a unifying device and beautifully complements the mesmerizing melody throughout this tender original selection by Ruth Elaine Schram, utilizing the familiar Irish Blessing "May the Road Rise to Meet You" and an Irish Prayer. Well suited for use in worship throughout the year, it will also serve as a wonderful benediction. A brief journey through scripture, outlining the unity of the Old and New Testament with respect to the plan of salvation, is beautifully enhanced with a distinctive melody that delicately paints the scene of Christ's love for us as demonstrated on Calvary. Weaving in themes from the beloved hymn, "When I Survey," the optional String Orchestra accompaniment adds a crowning touch to this moving work. For further flexibility for your music ministry, a string reduction is included with the string score. It's the Spirit of God New! This creative anthem by Ruth Elaine Schram and Aren Newell Williams tells the story of Pentecost and Christ's Ascension in an invigorating, upbeat, and uplifting way. As part of the Singable Solutions series, this concise and easy-to-learn anthem is a perfect option for those looking for a Pentecost anthem with a unique twist! Strains of "Still, Still, Still" open this gently expressive anthem, weaving in and out of the texture as the text offers an ardent prayer for the Prince of Peace to bring peace to a world beset by turmoil. Ruth Elaine Schram and Paul Baertschi give us gorgeous new music with delightful harmonic surprises in this easily prepared anthem suitable for the Advent and Christmas seasons. Absolutely beautiful for Christmas Eve services. In addition to the ten Accompaniment Tracks, two bonus tracks are included: "Hear the Angels Sing" (full orchestration by Stan Pethel recorded with live instruments) and "Holy Night, Silent Night" (medley of "Silent Night" and "O Holy Night," orchestrated by Ruth Elaine Schram, recorded with live String Orchestra). This relaxed and joyful arrangement of the gospel favorite perfectly conveys the happiness of those who walk life's journey with God as their guide. Voiced Two-part Mixed for ease of learning, with an optional Rhythm Section (parts available separately) or an Accompaniment CD for fun and sparkle. This tender ballad is an insightful look through the eyes of the child in all of us as we await the promised Messiah. The memorable melody, accessible parts and supportive accompaniment make this the perfect anthem consideration for Sundays early in Advent. "Like a child, I wait for the promises to be fulfilled...with a simple child-like faith..." Optional Flute part included in score. Beautiful! A Dramatic Musical Experience for Lent, Holy Week or Easter, for choir, speakers, piano, and optional small orchestra, exploring the words Jesus said in His final hours -- words that had not only the immediate meaning to the eye-witnesses at His crucifixion, but have universal, relevant meaning to us today. Available SATB or SAB. A Dramatic Musical experience for the Christmas season tells the story of Christ's birth and examines various reactions to His arrival. Accessible and within the capabilities of any size church or music program, available SATB or SAB. Small Orchestra parts are available separately (strings, winds, and light percussion, all optional) which will not overwhelm even a small choir. Ruth Elaine Schram's inspired pairing of Bob Kilpatrick's contemporary hymn with Pachelbel's beloved Canon in D creates a lyric, pastoral setting that is perfect for celebrating the Christian family at home and in worship during any time of year. Flexibly conceived, this piece is easy to prepare for SATB or Two-part Mixed choirs and includes optional parts for congregational participation. Delicately arranged from beginning to end, "Lullaby" combines an adaptation of the traditional Welsh "Suo Gan" text with "All Through the Night." Gorgeous accessible vocal lines are supported by a flowing accompaniment, all of which can be enhanced by the use of optional descant. The Flute obbligato adds a crowning touch to this lovely piece. 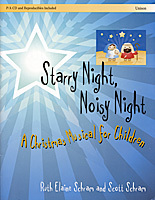 Ruthie Schram has created a charming and versatile setting for children's or adult treble voices. Besides being suitable for Christmas, this would be a beautiful selection for Baptism or Child Dedication services. Commissioned by the Grace UCC Choir of Frederick, Maryland, this tender prayer is composed with delicate harmonies in a simple, yet compelling, style. The text is based upon thoughts submitted by the singers and director (Truuke Ameigh) of this group. Suitable any time of year; makes a very meaningful song at memorial services. Available in two voicings for mixed choirs. Now included in the SATB/SAB/Two-part Mixed Songbook "Ready to Worship," featuring easy anthems for the entire church year. A delicate, yet powerful musical message is tastefully joined with the familiar carol, "O Little Town of Bethlehem" in this heartfelt expression for the Christmas season by David Gaines and Ruth Elaine Schram. A short, optional a cappella section quoting the hymn is artfully woven in to this arrangement. Optional string orchestra parts (by David Dixon) bring additional beauty to this reflective setting. String score and parts or an Accompaniment CD are available separately. Ruth Elaine Schram crafts a tender and expressive devotion to the unswerving love of God for His people, incorporating the beloved hymn "O Love That Will Not Let Me Go" and an optional flute obbligato. Flexibly voiced for SATB or Two-part Mixed, this anthem is a great fit for choirs large and small. A Performance / Accompaniment CD is also available. Suitable for General use, Lent, or Wedding Services. "Night of Wonder, Night of Joy" is a worship service that celebrates the wondrous miracles surrounding the birth of our Savior, composed by Niel Lorenz and Ruth Elaine Schram with full orchestration by Stan Pethel. Lasting approximately 35 minutes, the presentation may be as simple as two narrators, or may involve more speakers and/or characters in Biblical costume. Available for SATB or SAB voices. This dramatic musical experience is certain to fill the hearts of all believers with a sense of wonder and joy in God's goodness to us through the gift of Jesus. 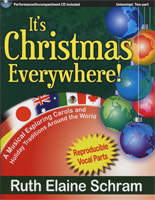 Bright and joyous, this work is custom-tailored for smaller church choirs at Christmas. With flexible part writing that can be presented by SAB or Two-part Mixed choirs, and options for handbells, its inclusion of "O Come, Let Us Adore Him" makes this one-rehearsal anthem especially appealing. Handbell part is included in score for a wonderful "Ring and Sing" holiday anthem! Cleverly combining two Christmas favorites, this tender anthem provides the opportunity for a children's choir (or soloist or small ensemble) to open with the melody to "Once in Royal David's City." This transitions seamlessly into "O Little Town of Bethlehem." The optional cello accompaniment helps to set a mood of peace and joy for your Christmas Worship Service. Commissioned by the West Yarmouth Congregational Church of Cape Cod, Massachusetts, in celebration of their Handicap Accessibility Renovation, this warm and reverent anthem calls all people to enter God&apos;s house to renew their faith and to praise Him. The centerpiece is the inclusion of two stanzas of the traditional hymn "In Christ There Is No East or West" (ST. PETER; words by John Oxenham, music by Alexander Reinagle). Flexibly voiced for either SAB or SATB voices. "Praise Is Rising" is a must-have collection for pianists involved in contemporary or blended worship services. The editor, Larry Shackley, has selected a dozen of the most popular and enduring worship songs of the past three decades and asked six of your favorite arrangers to provide fresh, original settings that you can enjoy at home or share with your congregation. Sometimes introspective, sometimes majestic, and sometimes bursting with exuberant praise, "Praise Is Rising" is a book you'll turn to again and again! Nine flexible Piano solos for the Easter Season, including arrangements of favorite hymns for Ash Wednesday, Palm Sunday, Lent, Easter, Pentecost, and Communion services. Designed to be adaptable to the changing needs in today's Worship Services that often have time constraints, these arrangements are easily expandable or contractible with optional start and stop points, and optional short endings (to stop there) or long endings (that lead into the next section). This remarkable addition to Ruth Elaine Schram's Prayludes series is a musical exploration of who God is. Each selection brings together two or three treasured hymns, centered around the characteristics of God. The well-written arrangements are accessible and flexible, making this an incredibly handy and valuable resource for use throughout the church year. Hymn tunes include: Nicaea; Grosser Gott; Holy is the Lord; Showalter; Lancashire; Wellesley; El Nathan; Forest Green; Ellacombe; St. Denio; At. Margaret; Martin; Eventide; Whole World; Ein Feste Burg; St. Anne; Moody; Cwm Rhondda; Darwall's 148th and Lyons. Here are nine fresh arrangements that are moderately easy to prepare in minimal rehearsal time, and designed to lay comfortably under the fingers for most church organists. Pedal parts are included on the second staff and avoid large intervals. There are "No Ped." sections to provide aural variety and an opportunity for the feet to rest. The songs are organized to provide a nice flow and mixture of styles, and, like all of Ruthie's "Prayludes" books, have clearly labeled optional start and stop points to make it easy to customize the length of song needed on the spot, or reprise an excerpt later in the service. Songs (structured as mini-medleys) include: All Praise to Thee (Sine Nomine/Dix); Praise and Glory (Italian Hymn/To God Be the Glory); Glory and Grace (Lemmel/New Britain); Joyful! (Hymn to Joy/St. Anne); Praise and Worship (Lobe Den Herren/Lyons); Holy King (Nicaea/Darwall's 148th); Crown Him (Coronation/Diademata); and Heaven (Heaven/St. Thomas). Resting In Your Arms New! With a fun-to-sing gospel swing feel, this flexible anthem by Ruth Elaine Schram and Aren Newell Williams focuses on the peace found in trusting the Lord and walking with God. The tune "Peace Like a River" is cleverly paired with the original melody. This anthem can be quickly prepared and has a broad application and usability in worship services. Part of the new "Created for Praise" series, "Scripture Songs" offers a great way to teach the Bible to young children, offering twelve delightful traditional children's tunes with new lyrics adapted from scripture. Easy to teach and fun to sing, each title is arranged by Ruthie Schram for unison voices and keyboard with opportunities for beginning two-part singing. 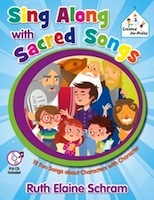 Great for children's choir, Sunday School, Christian school, Vacation Bible School, or church camps, this collection features reproducible lyric/activity pages. As an added bonus, Tim Hayden has created an exciting orchestrated CD track. 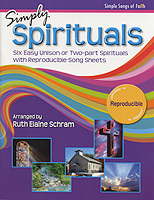 Six easy Unison or Two Part Spirituals with reproducible song sheets arranged by Ruth Elaine Schram. Second in the "Simple Songs of Faith" series with young singers and developing choirs in mind. From Abednego to the Wise Men, the Bible's many appealing--and instructive--characters are the centerpiece of this collection of delightful songs by Ruthie Schram. All of the songs, a mix of familiar favorites and originals, are very easy to sing. Accompanying body motions are suggested too, adding another layer to the fun. Great for Sunday school, Christian school, children's worship, children's choir, vacation Bible school, and church camp, this collection also features reproducible lyric/activity pages. The CD includes accompaniment tracks that facilitate rehearsal or performance in a choral setting along with performance recordings that are perfect for modeling and create an irresistible invitation for children to join along in song. Song of Joyful Thanks New! This tender original anthem from Ruth Elaine Schram and Aren Newell Williams is excellent for the Thanksgiving season or throughout the rest of the year. Voiced for two-part mixed or SAB choirs, it is an easy-to-prepare anthem that serves many purposes. Energetic and joyful! Delightful, charming Christmas Musical by Ruth Elaine Schram and Scott Schram for Grades K - 6 in a budget-stretching all-inclusive Book/CD combination. Filled with humorous references to modern distractions that prevent us from experiencing the true meaning of Christmas, the story is told from the stable animals' point of view. Appropriate for performance by as few as 10 children or many more, flexibly designed with minimal dialogue and many familiar melodies. This tender anthem eloquently demonstrates God's desire for us to open our hearts to Him. With flowing accompaniment and simple harmonies, this touching setting is accessible for choirs of all skill levels and sizes. Suitable for general use, and due to its references to the promises of Advent, perfect for the Sunday after Christmas as a reminder to keep Jesus in our hearts all year long. "...Stay with me, let me be your counselor (Wonderful Counselor). Stay with me, let me be your God (Mighty God). I know it can seem hopeless, but this is why I came; stay with me, in your heart let me remain..."
Step by Step with "Lead Me, Lord"
Ruthie Schram has seamlessly woven together the tune "Step by Step" by David Strasser with the traditional nineteenth-century hymn tune "Lead Me, Lord" (by Samuel Wesley) in this gently flowing prayer for God to lead us throughout life's journey. Part of the "Ready to Worship" series, this inspired arrangement features easy vocals that are beautifully supported by the accompaniment options. Scored for Piano, String Synthesizer, and live Cello; suitable for Discipleship, Eastertide, and General use. The lilting melody and triple meter give the lovely carol "There's a Song in the Air" (by Josiah Holland and Karl Harrington) a tender quality that is enhanced by Ruthie's setting, which is full of lovely harmonic nuance. The text images are sheer poetry, focusing on the nativity and the message that Mary's babe is King of kings. The flexible SATB / SAB voicing makes it easily prepared for Christmas Eve, Christmas, or Christmastide. Optional Flute Part adds a crowning touch and is included in the score. With an enchanting melody and gorgeous accompaniment, this piece captures the wonder of our ability to move God's hand through the power of prayer. This simple yet powerful merging of text and tune captures the delicate theme of this eloquent work. "To come before the throne, to know His boundless love; to feel the breath that moves like the wings of a dove; to lift my heart and mind to the nobler things above; to touch the heart of God -- this is prayer..." Another signature piece from Ruth Elaine Schram, complete with poignant text, memorable melody, and playable, supportive, yet strikingly beautiful accompaniment. Simple, yet strikingly beautiful, "Until We Meet Again" is an inspired, yet practical worship offering by Ruth Elaine Schram that incorporates the beloved traditional hymn "God Be with You Till We Meet Again." It can be performed without the extended "amens," as a brief benediction with congregational participation. The closing "amens" can serve as a separate response or benediction, or combined with the opening section for a truly memorable benediction anthem. This Orchestration premiered by Covenant Presbyterian Church, Oklahoma City, Oklahoma. A bright swing tempo and blues harmonies create an infectious spirit in this anthem as the two vocal parts call to each other: "Jesus, we praise your name!" The independent vocal parts are easily taught to young singers, and a supportive accompaniment insures successful performance for any age group. (May be done unison as well.) Fun and energetic, this piece conveys the important message to trust in God during times of trouble. Delightful Accompaniment Track is available, orchestrated by Tim Hayden. This unforgettable Advent anthem (in the "Ready to Worship" series) with lovely original text images incorporates the traditional carol "We Three Kings of Orient Are" (music by John H. Hopkins, Jr.). It prompts us to consider that we all are waiting for the Messiah. Flexibly voiced for SATB or SAB choirs, accompanied by Piano with a gorgeous Cello obligato (optional; available as a free digital download from Lorenz). Beautifully recorded Accompaniment CD available. To download the cello part, visit www.lorenz.com and search 10/4372L. Perfect for Mother's Day, Father's Day, Christian Family Sunday or any service with a family focus. The innocence and sincerity of the text is lovingly crafted in a simple melody for children, echoed and enhanced by the SATB choir. The children begin by stating to parents, "When I honor you, God is lifted up..." and from there it builds into a beautiful statement of the importance of honoring and respecting one another in God's design for home and family. Ruth Elaine Schram artfully weaves an original melody with the beloved American hymn by William Billings. Hauntingly beautiful, this accessible anthem will make a great addition to your Lent and Holy Week collection. Flexibly voiced for SATB or Two-part Mixed choirs, with optional Oboe obbligato. Oboe part is available as a free download from the publisher. Displaying the unique and creative gifts of Ruth Elaine Schram and Ken Bible, this song poses the question asked by those who witnessed the triumphant entrance of Christ into Jerusalem just days before that same crowd would cry for His crucifixion. The artfully written text for Palm Sunday also answers the question: who is He who comes to die? Exalting Christ as Savior, the music is beautifully presented to support the celebratory mood of the crowd and the solemnity of the pending death on the cross. The celebratory feel of the music is enhanced by a dance-like clarinet (or C-instrument) part that weaves in and out of the melody line with grace and style. The addition of percussion instruments contributes color and an appropriate quasi-Hebrew flavor to the overall effect. Accompaniment Track is available and includes both Stereo and Split Track formats. Reflecting on the many things that make Christmas so special, the writing team of David S. Gaines and Ruth Elaine Schram asks, "Will you make room for the Christ-child, a home for Him on earth? Will you make room for the Spirit as He brings new birth? Will you make room in your life for love's pure light to shine?..." Poignant and filled with sentiment, this anthem moves quietly through a mood of introspection, and briefly quotes portions of "Thou Didst Leave Thy Throne." (The entire hymn is printed on the back of the anthem if you wish to incorporate it into the anthem or your worship service.) Effective any time during Advent or Christmas. A majestic opening statement soon gives way to an easy, more contemporary "feel" in this original ballad with supportive, flowing piano score and a theme suitable for youth or adults alike: "God, how wonderful you are!" Based on Psalm 104 and commissioned by the Youth Choir of First United Methodist Church of Ft. Worth, Texas, under the direction of Mark Burrows. "Who makes the clouds His chariot? Who rides the wings of the wind? Who laid the earth's foundations, which shall not be moved? ... Who stretches out the heavens, just like a curtain of stars! Who wears the light as a garment, Who rides the wings of the wind..." Powerful, fresh setting of the poetic "Bless the Lord, Oh my soul" text. Suitable for Transfiguration Sunday as well as general use throughout the church year. In an evocative yet understated fashion, this anthem of supplication and thanks to our Creator is appropriate for any worship service, but especially those celebrating Harvest and Thanksgiving. 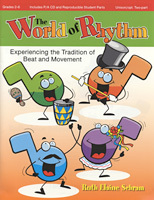 Follow the genesis of rhythm and musical styles from the 1800s to the present in this entertaining and educational journey for Unison / Opt. Two Part Voices. Book/CD Combination is suited to classroom or performance use. Ruthie Schram's original text examines the great mystery of our Lord's sacrifice on the cross as it pairs with the haunting Scarborough Fair melody. The flexible voicing (SATB or Two-part Mixed) makes this piece ideal for choirs of all sizes. Beautiful Cello part is available as a free download from the publisher. Visit www.lorenz.com and search for 10/4452L. Performance / Accompaniment CD is also available.